The stunning Taormina 5 star hotel the Hotel La Plage offers guests luxury accommodation, high quality service and exceptional amenities. The Hotel La Plage has a wide range of rooms, suites and villas. All of which are beautifully furnished with stunning views. Villas come with private garden and every comfort imaginable to ensure that guests find complete relaxation and tranquillity. The rooms in this Taormina 5 star hotel are equipped with all of the necessary amenities from air conditioning and heating (depending upon the season) to Internet access, Plasma TVs, and ipod docks to name but a few. Villas are also available with sea views and outdoor Jacuzzi offering not only space but also that little something extra. 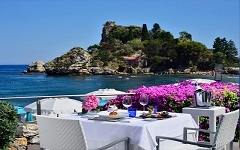 Outside guests’ private haven this Taormina 5 star hotel has a wealth of facilities. The exclusive beach club offers 200 sun beds, umbrellas, a kiosk bar and a gazebo for massages. There is also a ‘beach butler’ to ensure that guests every need is catered to. The Hotel La Plage also has an onsite gym and SPA facilities where guests can find complete relaxation. As well as onsite facilities this Taormina 5 star hotel the Hotel La Page also warmly invited guests to explore the surrounding area. Organised trips cater for all tastes from those searching to increase their knowledge of local wines to those who desire a bit of adventure such as paragliding, diving or horse riding. After a long day full of exploration and adventure the Fusion bar is ideal to unwind and recall the day. Once taste buds have been wakened then there is no better place to experience food at its best than at the adjoining Fusion restaurant. This restaurant creates dishes which focus on flavour, simplicity and balance, whether food connoisseurs or those who simply enjoy a good meal this restaurant in unforgettable. C’è veramente posto per tutti nel beach club di questo lussuoso hotel 5 stelle a Taormina. La nostra spiaggia dispone infatti di 200 lettini, 100 ombrelloni, un chiosco bar ed un invitante gazebo per i massaggi, dove potrete godere di un trattamento all’aria aperta con oli ed essenze selezionati, lasciandovi accarezzare dalla brezza marina. Per i più dinamici, il nostro hotel, grazie alla collaborazione con esperti del settore, organizza numerose attività di team building all'esterno della struttura nelle aree limitrofe. Se sceglierete di regalarvi una vacanza presso il nostro raffinatissimo hotel 5 stelle a Taormina vivrete una vacanza all’insegna del relax e del comfort.